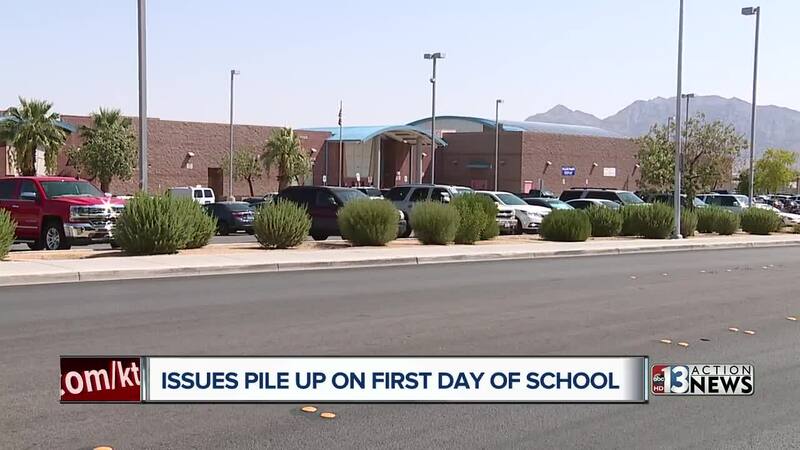 Parents were excited to walk their children to class at a new Las Vegas elementary school but left searching for the crossing guards they expect to keep students safe going to and from campus. You can still see playgrounds under construction and caution tape around landscaping that hasn't been finished but parents taking their children to Shirley A. Barber Elementary School still expected all of the safety precautions in place. "No crossing guards at all. I was concerned, very scary. There are just kids crossing with no help," Vanessa Gates said. Gates said she reached out to the school and was told to call Clark County Public works about her concerns. A Clark County spokesperson said they hadn't ordered a crossing guard for the school because there weren't any crosswalks painted when crews visited the school, near St. Rose Parkway and Spencer, Friday. The spokesperson said it is standard procedure not to put a crossing guard at the school when there isn't a crosswalk in place. After visiting the school Monday the county said it has placed a request for a crossing guard with the company it uses and said there should be someone in place by Wednesday. Gates said she will look for a family member to drive her 4th grader to school until crossing guards are on duty.